Holy River Family Band - "Welcome To Riverhouse"
While I thoroughly enjoyed Holy River Family Band's debut CD, "Haida Deities", I felt that the music tended to continue good jams even after the ideas had played themselves out. I'm pleased to say that on this new release the band has taken a giant leap forward and done so with the confidence to make it a two-CD package. As before, the band lineup includes Jens Unosson on organ, electric piano, analog synth, bells, and vocals, Arne Jonasson on guitar, saz, bouzouki, oud, sitar, cümbüs, mey, zurna, violin, hurdy-gurdy, recorder, vocals, and Mathias Barder on drums, percussion, flutes, and vocals. The big difference for this listener is that the music has more of a sense of direction. There are more shifts in mood, atmosphere, and even style. The cosmic instrumentals are still there but we also have vocals on several songs which are a welcome addition. The trademark sound is still psychedelia with an Eastern flavor. Arne Jonasson's many acoustic stringed instruments ensure that the music is always interesting though I have to confess I still don't know what a saz, oud, cumbus, mey, or zurna are. Across the two CD's there is a perfect mix of acoustic instruments and slowly soloing electric guitar. Jens Unosson's synths lift the stage into the heavens at times with slowly meandering melody lines and at others with multi-textured layers of keys that Jonasson jams to. On some tunes his organ gives the songs a cool 60's pop-psych feel. But this is only the surface as much instrumental activity is going on in the background. In fact, the music can be quite complex despite the ease and dreaminess of the pace. The best moments though are when Mathias Barder adds flute to the mix. I can just feel the cloud ease itself underneath and carry me away. In summary, the band has taken the ideas that were introduced on Haida Deities to produce a solid and better defined work. For more information email The Wild Places. 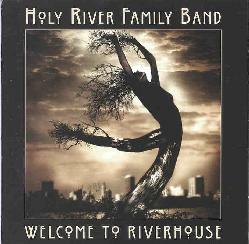 You can also visit Holy River Family band at their web site.